Imagine The Tree Of Life’s dawn-of-creation sequence recreated with electrical tape and Popsicle sticks to equally dazzling effect, and you’ll have some idea of the magic that animator Don Hertzfeldt can work with stick figures and construction paper. A one-man operation in a medium overwhelmingly dominated by the industrial model, Hertzfeldt has built a dedicated following over the past two decades. Early shorts like “Ah, L’Amour” depict the cruelties of life with brutal and sometimes violent wit, but with 2000’s “Rejected,” Hertzfeldt began to push into more complicated territory. Ostensibly composed of rejected promo spots for the fictitious Family Learning Channel, the Oscar-nominated short strings together a collection of hilarious non-sequiturs that gradually grow more demented and disturbing, until the film begins to literally collapse in on itself. 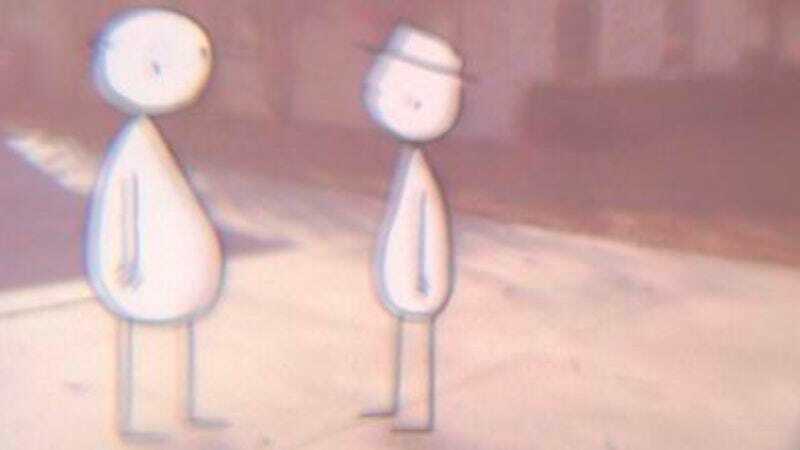 With 2005’s “The Meaning Of Life,” Hertzfeldt began mixing his pencil animations with elaborate in-camera effects, and his ambitions took another leap the following year with “Everything Will Be OK,” the first part of a trilogy that closes with the just-completed “It’s Such A Beautiful Day.” Over the course of the three films, the trilogy’s stick-figure hero, Bill, confronts an unidentified but evidently life-threatening illness that eventually lays waste to his conscious mind, a degradation rendered no less terrifying for the fact that Bill’s essentially a black-and-white blob with legs. During a break from a cross-country tour showing the completed trilogy and other films, Hertzfeldt called The A.V. Club from his home in Austin to discuss the insanely labor-intensive process behind his films, his plans for a feature film, and why artists shouldn’t always get what they want. The A.V. Club: If you compare the simplicity of an early film like “Billy’s Balloon”with the handmade cosmos of “The Meaning Of Life” or the overlapping images of the trilogy, there’s a tremendous progression in technique. But one thing that hasn’t changed is that your protagonists are still stick figures, which is the crudest possible way of representing the human form. Why stick with stick figures? Don Hertzfeldt: I think primarily, if you try to imagine Bill’s movies, those three chapters, with Bill as a photo-realistic, computer-generated thing with a hundred moving parts, I think it would just be intolerable. None of this was calculated. Many of these movies are written as I go, and a lot of it is hindsight. It’s things that kind of feel right and intuitive. And I don’t want to make it sound like filmmakers are super-amazing people who know what they’re doing all of the time, because most of the time I have no idea what I’m doing. But I think there’s so much going on in the narration, the screen is splitting up, the soundtrack is complicated, the music is blaring, I think if the characters weren’t minimal, if you didn’t have that white negative space, it would just be really, really difficult to watch. I think I would be elbowing you out of the frame and writhing around with myself up there on the screen. The minimalism of the characters, in hindsight, provides a place that you can project yourself. I think it’s very easy to relate to a simpler character, and I’ve learned also that, just from animating Bill through these three movies—you’ve seen the older ones. He’s the most minimal of very minimal characters to begin with. He’s just a circle with a couple of dots and a couple of lines, and I’ve realized how much more difficult that is to animate and to get a performance out of, because you’re literally working with less. I’ve grown convinced that if one of his little eye dots, for instance, is a millimeter this way or that way, his entire expression shifts and every line, every dot, suddenly becomes really crucial. Every little nuance of the line is magnified because this is all you have to work with to show a character is thoughtful or pensive or afraid, and it’s been very careful and very interesting to work with someone like that. The final part of the answer is that it’s also just the way that I draw. I think it’s honest. I’m not trying to force that style into a story that I don’t think would benefit from it. I didn’t study animation, I didn’t go to Cal Arts, I didn’t take a lot of life-drawing classes. I went to film school wanting to be Stanley Kubrick like everybody else and do live-action. I sort of fell into animation accidentally, and it snowballed. But my heroes are still live-action guys. I still feel like a live-action filmmaker who thinks in live-action, but just happens to draw. AVC: Unless you’re Stanley Kubrick, animation is the only way you can spend years working with no practical limitations. DH: You can literally put anything on the screen. Some people would call it the purest way of making a movie, because you are literally building every single frame from nothing. There’s something amazing about that as well. But you will spend two years in a dark little room somewhere, working on a short. It’s very easy to lose time; it’s very easy to get lost in that. But when it’s released and it’s out there, there’s not much that feels as satisfying. AVC: One of the things that’s fascinating about animation is that because you’re starting with a blank canvas, every film has its own distinct style, where with live action if you film two people talking in a room, it’s generally going to look like two people talking in a room. The Animation Show programs you and Mike Judge put together were a great demonstration of that diversity. DH: I think that’s what attracts me to shows like The Animation Show and festivals like that as well, where if I asked you to draw me a guy on a bicycle, it would look a lot different than me drawing a guy on a bicycle, different than someone else on the street drawing a guy on a bicycle. Your lines, it’s your personality. You bring something very unique to that. Because the drawings look so different, each one is telling a story before your story even starts. If you look at a Tim Burton drawing or a Mike Judge drawing or a Bill Plympton drawing, as soon as you see the artwork, there’s a worldview, before the narrative starts. That’s an amazing thing. It’s not often I get that from a lot of the new computer-animated films, and that’s a major drawback, I think. I’m not sure where in the process it gets lost, but if you ask a computer animator—and I don’t want to throw computer animation under the bus at all, it’s just an example—“Draw me a guy on a bicycle,” you’re going to get a perfectly rendered bicycle. It’s a noun. I’m not getting anything else from that artwork. It’s something I miss, and I think that’s the charm of hand-drawn animation. You get not only the story, but this amazing, unique line art that you can’t replace and that is identifiable. AVC: A lot of computer animation is plugging different variables into texturing algorithms and so forth. It’s almost a different medium at that point. DH: There are amazing things that can be done there that you can’t do other ways. It’s become sort of twisted into a competition, a versus sort of thing, and I’ve never understood that. It seems like we have 100 years of great, amazing film technology, and I don’t know why there’s a desire to throw any of our tools out of the toy chest. When digital came around, the people who were selling that technology turned it into film versus digital and 3-D versus 2-D—there can be only one. It was sort of shoved down a lot of artists’ throats, and before you know it became, “Well, we can’t have both. We can’t have hybrids.” What we’ve been doing over the years, and I think a lot of artists are now doing this, too, I’m still drawing on paper, I’m still animating and shooting with these 35-millimeter cameras from 60 years ago, but we’re editing digitally and doing the sound digitally. There are very easy ways to make things play well together. AVC: It’s a practical issue as well as an aesthetic one now, since we’re looking at a time when there’s simply no film stock being made to shoot on. DH: I think there’s this illusion, and I think it’s a part of the sales pitch, that digital is easier, and that computer animation is easier. It’s certainly more convenient. These cameras I have are 800 pounds, they don’t move very easily, and film is fragile, it’s expensive, there’s processing. There’s no argument that it’s less convenient. But when it comes to animation, there really are no shortcuts. Computer animators work just as hard as someone like me, and I think that’s a big misconception. I think a lot of the public, when they see a special effect these days, when they see animation these days, the immediate assumption is—it’s not like, “Wow, how did they do that,” it’s, “Oh, they just used a computer.” As if there’s a “Make Art” button on a computer, and it’s just this magical little glowing box that nobody knows how it works but it just spits out these amazing images. I think computer animators get the short end of the stick a lot of the time, because again, there just are no shortcuts. Whether I’m shooting with these cameras or whether I’m sitting there with a mouse, it’s still this grueling, frame-by-frame process, telling a story in extreme slow motion. What I do love about the camera is, for these films, for Bill’s movies in particular, I’m getting visuals that I would never have imagined. When I work with Photoshop or digital tools, it’s really great and very convenient for when I know exactly what I want—for when I know exactly where to artificially place everything on the screen. But most of the time, I don’t know what I want until I see it. And I don’t know if filmmakers should always get what they want, because so many times your first idea doesn’t work, or it looks terrible, or it just doesn’t play right, and you have to roll with the punches and think and think and think and get these alternate ideas, and those are almost always better than my first idea. It’s always the blessing in disguise, these happy accidents that wind up improving the movie. What these cameras do, you’ve seen the films, there’s so many optical effects with images marrying and multiple exposures—so much of “It’s Such A Beautiful Day” was shot through magnifying glasses and broken glass and plastic sheets of diffusion—and when you’re playing with light leaks and everything on top of it, you get these images that sitting in front of a monitor, not only would I not know how to make it happen, it would take forever and I would never have visualized it. It’s like putting your images in a box full of light and color and shaking it up and getting it back from the lab, and you just get these amazing experimental things. So that’s why these movies, at least, could not have been made digitally. Like you say, it’s a strange thing now where the film seems like it’s going extinct. I think people, for live-action at least, will be shooting film for at least 50 years. There are enough guys like Spielberg and Scorsese and cinematographers who insist on shooting on film, and there are enough young people who want to be like them to keep it going. I think projecting on film is not long for this earth, and a tour like the one I’m on now, which is 35-millimeter, this might be the last time I really tour the country and take advantage of that. But the cameras I use are from the ’40s, from the ’50s, and they still run, I’m guessing, as well as they did back then. They’re very simple machines—an electrician could probably figure it out in a couple of hours—and I get these beautiful images from them. I never imagined that they would live longer than the film. One day they’re just going to be these amazing conversation pieces. As of now, I have two in the house right now, and they look like torture devices from the 1800s, and I can’t imagine having to explain what these even were in 30, 40 years. AVC: You do your visual effects in-camera, using multiple exposures, which means you don’t have any idea what it’s going to look like until the film comes back from that lab. For something like “The Meaning Of Life,” where you spent weeks creating the orbits of dozens of separate stars, is it nerve-wracking to think you might spend all that time and then end up with an unusable mess? DH: You’re shooting blind. You’re shooting a film, there’s no video playback. So much of it is math and timing. If you go through those special features on DVDs, you see a lot of those pages of camera notes, and pages and scribbles with numbers all over them. AVC: Plus signs and parentheses and numbers and so forth. DH: Exactly, all of that stuff. They’re camera notes and timing notes. For something like the “Everything Will Be OK” films, when the screen is splitting up, it’s choreographing when each little window of action pops up and moves away. Each one of those I’m shooting through a little miniature hole in a scrap of black construction paper that’s right in front of the lens. When I’m working on one of those movies, there’s piles of scraps of black construction paper all over the studio floor, like some little depressed kid’s art room. I’m just trying to find the right hole, the right shapes. When they open and close and zip around, it’s just stop-motion animation on a little scale. And each window is a separate camera pass. So when you look, and they’re probably not very self-explanatory, but all those camera notes for those films, I’m choreographing the entrance of every frame of where those interact and zip around. For something like “The Meaning Of Life,” the shots with the suns—it might say on the DVD, I can’t remember now—I would say there’s dozens of camera passes, if not more than a hundred separate camera passes. AVC: You said 112 camera passes or something like that. DH: Exposing each different element. It’s a movie that I’m happy with, and it’s a movie that I’m glad I’m done working on. I feel like I’ve since gotten smarter about getting more out of other areas, getting more out of the camera rather than pounding it all out on the art desk, and getting more out of the soundtrack than pounding it out of the camera. It was a fantastic learning curve, but it wasn’t the best environment for making a movie, because I’m so much more comfortable with writing as I go, and changing the story as I go, and improving as I go, because I know I’ll be in a dark little room for two years, give or take, and so by the time I’ve written and animated this one scene several weeks later, I know I’ll have these other ideas, and I can put those in, and I can hang those on the skeleton. “The Meaning Of Life” was a movie that was pretty much set in stone from the beginning, and there’s not a lot to improvise there with that story because it was more visual, so I wasn’t able to fire off of my best cylinders because it became more about the technique than about the writing. And the writing is really the only thing that keeps me happy and keeps me getting to the art desk every single day for that long. It’s got to be something that if it still makes me laugh, it’ll make somebody else laugh. If it still makes me think of something, maybe it’ll have something of value to somebody else. So that’s why when I got to the Bill movies, it was like a vacation. I could finally write and feel a little more creative and flesh out the movies the way I like to do. AVC: There’s the line in “I Am So Proud Of You” about one of Bill’s ancestors “strangling a rock in a fit of religious excitement,” which is good enough to make any novelist jealous. It’s almost unfair. DH: I’m not the kind of animator—and again, I’m not classically trained, and sometimes I feel strange referring to myself as an animator, because it would be a disservice to people who studied—but I’m not the kind of animator who’s going to get a kick out of figuring out a new way to make a leaf fall from a tree. It’s got to be the writing. I love editing, I love doing the sound work, I love working with these old cameras, obviously. But to me, the animation is the busywork. It’s grinding out, it’s connecting the dots that I have to do to tell this story. But the only reason I have that energy is the writing. It’s those ideas that just pop in when you’re in traffic. AVC: Professional animators often get irritated when mainstream reviewers focus on the technique of an animated feature, when they’re much more concerned with story. DH: That’s very true to a degree. I’ve always felt sort of apart from the animation community, maybe because I didn’t go to school and maybe because my heroes are live-action guys, I don’t know. But whenever I do go to an animation blog or pick up an animation magazine and go through it, or even if there’s a New York Times article about animation, I almost never see anything about story. It’s almost always about technology. Nobody writes about writing. That’s such a strange thing. It’s like you were saying, it’s a medium of film that’s separated only by form and technique. So many people still think of it as a genre, which doesn’t make any sense at all. You often find articles about live-action screenwriting and story and famous live-action screenwriters, but I don’t know if I’ve ever read anything about animation writing. I don’t know if maybe it’s even important; maybe you shouldn’t think of animation as writing for animation but just writing. I don’t understand the divide. It’s just a strange thing that we do. AVC: The way the Bill films are put together isn’t straightforward narrative, more like a kind of associative logic. How do they come together, and how much of the structure is planned in advance? The only person who’s credited other than you on all three films is an editor, Brian Hamblin, but presumably it’s not a matter of choosing takes the way a live-action editor would. DH: He’s an old friend from film school, and he works over at Sony ImageWorks now. He’s credited as the editor, but I would give him the bigger credit of post-production supervisor. He’s an editor in a sense that he has the terribly boring task of assembling the films based on all of my nonsense notes. Brian won’t come into the picture until the movie’s nearly finished, after it’s been written, shot, and I’ll have the footage that I can send to him, and based on my notes—this frame connects to this, take this frame, put this scene over here—he just puts everything together based on what I send him, and it never makes any sense because he doesn’t have the soundtrack yet. They’re silent movies until they’re shot and cut, and then I have the final form that I can start putting the sound in. So he doesn’t know what we’re working on until I send him a soundtrack after the picture has already been logged. So he really is the unsung hero of all these films, because he’s an expert on all the latest digital media. He makes sure that the neg cut goes smoothly when we conform the actual film negative to match what we’ve been doing digitally. It’s just all these things that I’m completely ignorant of and would be lost without. So it’s easier to credit him as editor, but it’s really all of these things. But unfortunately for him, they’re uncreative things. It’s a technical job that I’m very, very grateful he’s been able to do. So anyway, beyond that, you’re asking creatively how they come together, right? DH: Well, I touched on it before, about how you’re just sitting in traffic and you get this image. So much of my writing, at least, the worst thing I can do is sit in front of a blank page, like the cliché, and just be like, “Today, I’m going to be creative!” Nothing really good ever comes out of that. Sometimes you have to, sometimes you’re on a deadline, but when you sit and force it, it just doesn’t work. It’s almost like vomiting or like a bodily function. You go when you have to go. For me at least, I have Post-It Notes all over the place. And you’re doing the dishes, you’re in the shower, you’re in traffic, and there’s the ending to the movie, there’s this image. Sometimes it’s like in “A Beautiful Day,” where he’s having some tests done, and it says he has the image of a seahorse and a fallen tree, and it’s just something that just comes fully formed like that. There’s no reason. But there’s something poetic about it, and there’s very little rewriting beyond the initial spark, and I will go find a way to shoot a falling tree. When it comes time for me to actually write, it’s not so much about sitting down and sweating it out; it’s just gathering all these random thoughts and putting them in some sort of form. I think every writer will take things from their mind, take things they’re afraid of, things that they’d be researching anyway. I’ve always been interested in memory loss and neurology, and Carl Sagan and Oliver Sacks, and all these case studies. It’s just this mass of things that I want to see in a movie. So you put them in this form, and then visually that will tug it in different directions, too. I don’t want to spoil the movie for a lot of people who haven’t seen it yet, but some of the, I’ll refer to them as the Roger Rabbit shots, when he’s interacting with live-action—I won’t reveal which shot it was that was the first I did, because I don’t want to give the scenes away—but the first shot of that I experimented on just came out looking so much better than I thought it might. The image married so much better than I thought, and so I started pushing more in that direction, better visuals, and the writing went that way. The ending to the movie, which I definitely won’t reveal, it was a similar situation. I was a year and a half into the production, and the other bits of the movie were sort of improving, and the ending that I had just wasn’t going to cut it anymore, so I added on this five-minute extra thing in that direction, because by then, I knew that with the visuals that I could pull it off. A similar thing happened in “I Am So Proud Of You.” The movie grows and life happens, and it goes in directions you weren’t expecting, and the visuals come back looking different than you thought. The ending for that one was originally the ending that I thought might take place for the third one. I had in these notes what I thought might happen in chapter three while working on the second one, and I wound up cannibalizing it all. So I started chapter three with very little. I knew he’d wake up in the hospital after having a seizure, and that was really it. I guess overall it’s kind of stupid to make a trilogy without knowing fully where it’s going to go, other than vague notions. But it really kind of came together like that. I think when you’re working primarily alone, for that long, for such a small budget, it is one small luxury where you can fix it as you go. It’s not like a big-budget production where there’s a story department, a background department, a music department, and if a year into the production something’s just not working, you can’t really fix it unless you’re going to screw up all these other people’s jobs. You can’t add on new scenes. You can’t dramatically change something without costing a lot of money. You’ll get yelled at. So it’s one small nice thing. You don’t have to release it until it feels right. So many of my friends who make big-budget stuff, they don’t often feel like they finish a movie as much as it’s released. It’s taken away from them. Of all the grueling things of working this small, it is nice to have that one thing to hang on to. AVC: There was a pretty long gap between chapters two and three, broken only by “Wisdom Teeth,” which seems like a deliberate throwback to the simplicity and humor of the early films. Was that a deliberate palate cleanser? DH: It was. That was me blowing off some steam. I did “Everything Will Be OK” and “I Am So Proud Of You” back-to-back. And I’ve been in production on something constantly since I was 17. I’ve never had a break, partially because every movie’s necessarily had to pay for the next one. I could never take a break, I could never relax, because if I wasn’t working on something, now, I wouldn’t have anything to release next year, and I’d have no income. So, I needed to do something stupid and goofy again. It was perfect timing for that. I kind of blew off some steam there, and then I felt more ready to do the third one. AVC: “It’s Such A Beautiful Day” wraps up the Bill trilogy, but it also feels like a transitional work in the way that “Rejected” did, where by the end you seem to have broken through to a new level. There’s a lyricism to the coda that’s not like anything you’ve done before. Does it feel like a breakthrough in retrospect? DH: I guess so. It’s just constant pushing, exploring something different. Going back to “Rejected,” I think everybody, myself included especially, would be have been really bored if I did “Rejected” sequels for 12 years. I think of the trilogy the same way. It’s going in different directions. And I wanted to make sure first of all that each chapter can stand alone as its own piece. Like if you didn’t see one or two, you could still see three and not be confused or annoyed. And you need to justify their existence. You can’t just keep treading water and doing the same thing over and over. So it’s just constantly trying to push in different directions and do something different. I think I still feel like I’m learning with every film. I think when I was doing stuff like “Billy’s Balloon” and the student films, I wanted to make films like these, but I just wasn’t clever enough to know how to put them on the screen yet. Through something like “The Meaning Of Life” through “Rejected,” you get a little better, you get a little closer to those ideas. I think these films are just building on top of that and whatever’s next, maybe I’ll get a little closer still. But it’s the carrot on the end of the stick. You’re never going to make a perfect movie. You’re never going to get 100 percent of what was in your head. But you get a little closer every time. Having the freedom to write as I go is the only reason those films are what they are, because my initial drafts are terrible. I guess I should put it this way: If anything, if any of the shorts for the past 17 years had to have been pitched, like in L.A., in the traditional process, not a single one of them would have been made. They’re terrible on paper. They only work when I’m in there with the camera, and each one has had to pay for the next one. I would like to do a feature film next, and we’re getting started in that direction. The script is nearly finished, but it’s going to need a big budget, and it’s going to need a big crew, and I’m looking forward to not drawing everything by myself and collaborating. I’m really curious where this thing’s going to get made. With the shorts, it’s that incubation period, I’m so used to that. And I think it’s going to have to be reversed now, so the script needs to be perfect before I even start. I’m well aware that I can’t work the same way under the system. It’s going to be interesting. So much of writing is that inexplicable exploration. And I think so much is also about rewriting. The hardest part is the first draft. Getting that out, and then the rewriting, that’s really 90 percent of the work, and that’s where the best stuff comes from. AVC: It’s truly been amazing over the years watching not just your abilities but your audience grow. That a solo animator who’s never made a feature can sell out multiple screenings across the country really speaks to what’s possible for an independent filmmaker these days. DH: The most rewarding thing has been the fact that each film has paid for the next, that each one has sort of snowballed. It’s entirely based on DVD sales, ticket sales to tours like these, and people literally paying for the next movies. I think they’re aware of that. It’s a lot different than buying something from a distributor or buying something from a corporation that’s going to take 40 percent, and the artist gets nothing. You don’t feel like you’re supporting anything. I think people like that, they like knowing that when they buy a DVD, they’re literally paying for the next movie. When they buy a ticket, it’s not going to some strange third party’s Ferrari somewhere. It’s actually going to something that they like. AVC: Apart from just handing you money, it’s as direct as support can get. It’s not like you buy a ticket for a movie and figure some fraction of that price might make it back to the filmmakers, or that showing your support might enable films like that to be made in the future. DH: It’s as direct as possible, and that has been fantastic. It’s been a long slog through making these. I often don’t know where most of my 20s went. I have very few memories of working on a lot of these movies, because so much is repetition, so much is routine, where you’re just seven days a week, drawing little round heads, and your brain stops paying attention because there’s nothing remarkable going on after a while. But at the end of the day, it’s every filmmaker’s dream to just be able to make the movies that they want to make and have an audience waiting for them. I just feel so lucky, and I think that’s a big part of the reason I work so hard, because I feel stupid when I’m not making a movie. I feel stupid when I’m not in production on something, because this is such a rare thing. I just feel dumb if I’m squandering it and not doing something. AVC: That’s a nice note to end on.